During the course of this election season, Republican Senate Nominee Martha McSally has made much of her military background and her championing of veterans causes in general. However, voters should be made aware that on issues such as the recent tax cuts and the attempted repeal of the Affordable Care Act, McSally embraced the Republican gospel of voodoo trickle down economics and the harshness towards the ill and desperate rather than advocating the needs and welfare of her sister and brother veterans. The ability to get jobs with companies who wanted to apply tax credits for hiring disabled and returning veterans. 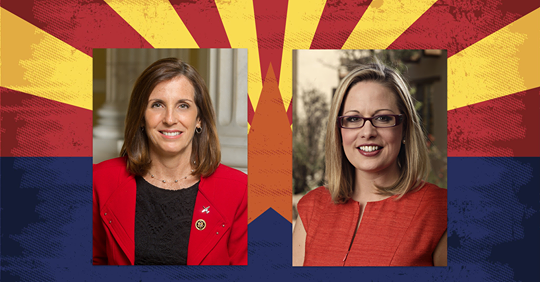 McSally voted to do away with that in the House version of the bill. The reduction of the interest on mortgage deduction from $1,000,000 to $500,000. McSally voted for this reduction. This would hurt veterans because, due to the nature of their position, they are more transient than individuals in other professions. Adversely adjusting the consumer price index so military retires may get less in their retirement checks. McSally approved this as well. Not caring for those desperate, ill, and in need. Supporting financial dark money banking interests by agreeing, to the astonishment of objective observers restrictions on the amount of interest that can be charged to veterans on “predatory loans.” Kelly Griffith, then the executive director of Tucson’s Southwest Center for Economic Integrity, said she was “absolutely stunned” at McSally’s vote on predatory lending. Supporting the cutting of job training programs that could help some returning veterans to transition to civilian professions. Voting against student loan counseling to veterans. Voting against the health care needs of veterans by approving a Veterans Administration bill that reduced the amount of health care veterans could receive and by voting for the repeal of the Affordable Care Act, which would have resulted in 6400 veterans losing Medicaid coverage. In August of this year, Representative McSally spent a couple of hours helping set up the annual Veteran Resources Fair. Unfortunately, our veterans need a Senator that is willing to advance their interests on all items that affect them rather than a glorified photo op. Voters on November 6 need to consider who will be the best candidate to serve as the next junior senator from Arizona. Think again if you are basing your decision in part on how well Martha McSally has worked for veterans and remember that Representative Kyrsten Sinema advocated for all the measures described in this article to help veterans that her opponent did not. politics, or just looking to earn more money. Job until November 6th. • Ask about our “Bring a friend bonus”. be considered. Please include your name and contact information. McSally and her supporters are running the dirtiest, most dishonest campaign in Arizona. I would have said the whole country except that some of the campaigns against black Democrats in the Deep South have gotten really bad in the last few days. So McSally does have some competition for being the dirtiest politician in the nation. As a legislator representing AZ CD2, she has accomplished nothing. She does not understand policy and she is in way over her head. She votes the GOP/Trump party line and, as a legislator, is as useless as a screen door on a submarine. Her military resume is all she has. But most of us fail to see how being a female A10 pilot qualifies her to be a legislator. She is employed well above her level of incompetence. Do not promote her.